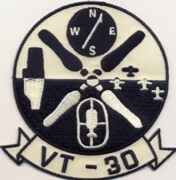 This is a reproduction of the squadron patch for VT-30, one of the US Navy's Training Squadrons that had a long history of preparing pilots for the Vietnam Conflict out of NAS Corpus Christi, TX. This patch does not come with velcro attached. Homepage | Order VT-30 Patches!